Glycoside, broadly defined, is any molecule containing a carbohydrate moiety (sugar) bound to some other part, which some authorities, but not all, require be a non-sugar moiety. Formally, a glycoside is any molecule in which a sugar group is bonded through its anomeric carbon to another group via an O-glycosidic bond or an S-glycosidic bond; glycosides involving the latter are also called thioglycosides. The given definition is the one used by IUPAC. Many authors require in addition that the sugar be bonded to a non-sugar for the molecule to qualify as a glycoside, thus excluding the polysaccharides. The sugar group is then known as the glycone and the non-sugar group as the aglycone or genin part of the glycoside. The glycone can consist of a single sugar group (monosaccharide) or several sugar groups (oligosaccharide). Glycosides play numerous important roles in living organisms. Many plants store important chemicals in the form of inactive glycosides; if these chemicals are needed, the glycosides are brought in contact with water and an enzyme, and the sugar part is broken off, making the chemical available for use. Many such plant glycosides are used as medications. In animals (including humans), poisons are often bound to sugar molecules in order to remove them from the body. Glycosides originally were defined as mixed acetals (a molecule with two single bonded oxygens attached to the same carbon atom) that resulted from cyclic forms of monosaccharides, such that there was an attachment of a glycosyl group to a non-acyl group (RO) (BCS 1996; IUPAC 1997a). 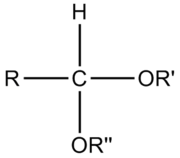 The bond between the -OR group and the glycosyl group is called a glycosidic bond. Later, however, the term glycoside was extended beyond those compounds to where the anomeric hydroxy group is replaced by the -OR group, to include those in which the replacing group is -SR (thiogrlycosides), -SeR (selenoglycosides), -NR1R2 (N-glycosides), and even -CRR1R2R3 (C-glycosides). For example, an S-glycosidic bond is one where the anomeric carbon of a sugar is bound to some other group via a sulfur (rather than an oxygen) atom, in contrast with an O-glycosidic bond where the anomeric carbon of a sugar is bound to some other group via an oxygen atom. An N-glycosidic bond would be where the anomeric carbon is bound to some other group via a nitrogen atom. There is also a C-glycosidic bond, which is simply a covalent bond between a sugar and an aglycon. However, the terms N-glycoside and C-glycoside, while in widespread use, are considered improper; thioglycosides and selenoglycosides are considered legitimate generic terms (BCS 1996). Molecules containing an N-glycosidic bond are known as glycosylamines and are not discussed in this article. In naturally occurring glycosides, the carbohydrate reside is termed the glycone and the compound ROH, from which the carbohydrate reside has been cleaved, is term the aglycone (or aglycon) (BCS 1996). The glycone and aglycone portions can be chemically separated by hydrolysis in the presence of acid. There are also numerous enzymes that can form and break glycosidic bonds. The most important cleavage enzymes are the glycoside hydrolases, and the most important synthetic enzymes in nature are glycosyltransferases. Mutant enzymes termed glycosynthases have been developed that can form glycosidic bonds in excellent yield. There are a great many ways to chemically synthesize glycosidic bonds. Fischer glycosidation refers to the synthesis of glycosides by the reaction of unprotected monosaccharides with alcohols (usually as solvent) in the presence of a strong acid catalyst. The Koenigs-Knorr reaction is the condensation of glycosyl halides and alcohols in the presence of metal salts such as silver carbonate or mercuric oxide. One can classify glycosides by the glycone, by the type of glycosidic bond, and by the aglycone. If the glycone group of a glycoside is glucose, then the molecule is a glucoside; if it is fructose, then the molecule is a fructoside. In other words, the terminal -e- of the name of the corresponding cyclic form of the monosaccharide is replaced by -ide-. Furthermore, if it is glucuronic acid, then the molecule is a glucuronide, and so forth. In the body, toxic substances are often bonded to glucuronic acid to increase their water solubility; the resulting glucuronides are then excreted. Depending on whether the glycosidic bond lies "above" or "below" the plane of the cyclic sugar molecule, glycosides are classified as α-glycosides or β-glycosides. Some enzymes such as α-amylase can only hydrolize α-linkages; others, such as emulsin, can only affect β-linkages. An example of an alcoholic glycoside is salicin, which is found in the genus Salix (willows). Salicin is converted in the body into salicylic acid, which is closely related to aspirin and has analgesic, antipyretic, and antiinflammatory effects. These glycosides contain an aglycone group that is a derivative of anthraquinone. They are present in senna, rhubarb, and aloes; they have a laxative effect. In this case, the aglycone is coumarin. An example is apterin, which is reported to dilate the coronary arteries as well as block calcium channels. Those obtained from dried leaves of Psoralia corylifolia have the main glycosides psoralin and corylifolin. In this case, the aglycone contains a cyanide group, and the glycoside can release the poisonous hydrogen cyanide if acted upon by some enzyme. An example of these is amygdalin from almonds. Cyanogenic glycosides can be found in the fruits (and wilting leaves) of the rose family (including cherries, apples, plums, almonds, peaches, apricots, raspberries, and crabapples). Cassava, an important food plant in Africa and South America, contains cyanogenic glycosides and therefore has to be washed and ground under running water prior to consumption. Sorghum (Sorghum bicolor) expresses cyanogenic glycosides in its roots and thus is resistant to pests such as rootworms (Diabrotica spp.) that plague the related maize (Zea mays L.). Here the aglycone is a simple phenolic structure. An example is arbutin found in the Common Bearberry Arctostaphylos uva-ursi. It has a urinary antiseptic effect. Rutin found in rooibos tea. These compounds give a permanent froth when shaken with water. They also cause hemolysis of red blood cells. Saponin glycosides are found in liquorice. Their medicinal value is due to their expectorant effect. Here the aglycone part is a steroidal nucleus. These glycosides are found in the plant genera Digitalis, Scilla, and Strophanthus. They are used in the treatment of heart diseases, such as congestive heart failure (historically, but are now not recognized to improve survivability; other agents are now preferred) and arrhythmia. These sweet glycosides found in the stevia plant Stevia rebaudiana bertoni have 40 to 300 times the sweetness of sucrose. The two primary glycosides, stevioside and rebaudioside A, are used as natural sweeteners in many countries. These glycosides have steviol as the aglycone part. Glucose or rhamnose-glucose combinations are bound to the ends of the aglycone to form the different compounds. As the name implies, these compounds contain sulfur. Examples include sinigrin, found in black mustard, and sinalbin, found in white mustard. Biological and Chemical Sciences (BCS), University of London. 1996. 2-Carb-33: Glycosides and glycosyl compounds. Biological and Chemical Sciences, University of London. Retrieved September 22, 2008. Brito-Arias, M. 2007. Synthesis and Characterization of Glycosides. New York: Springer. ISBN 9780387262512.
International Union of Pure and Applied Chemistry (IUPAC). 1997a. Glycosides. IUPAC Compendium of Chemical Terminology, 2nd edition. (the "Gold Book"). Compiled by A. D. McNaught and A. Wilkinson. Oxford: Blackwell Scientific Publications. Retrieved September 22, 2008.
International Union of Pure and Applied Chemistry (IUPAC). 1997b. Glycosyl group. IUPAC Compendium of Chemical Terminology, 2nd edition. Compiled by A. D. McNaught and A. Wilkinson. Oxford: Blackwell Scientific Publications. XML on-line corrected version (2006-) created by M. Nic, J. Jirat, B. Kosata; updates compiled by A. Jenkins. Retrieved September 22, 2008. This page was last modified on 22 September 2008, at 21:12.